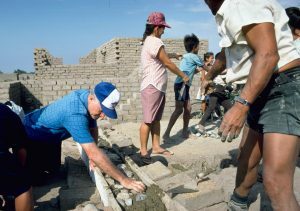 Scarboro lay missioner Gerry Heffernan served in Peru, helping the people to build their own homes. I would like to connect the Good Samaritan in the Gospel of Luke with two stories. In the first story, Scarboro missioner Fr. Ambrose MacKinnon is working in St. Vincent and the Grenadines and stationed in a village called Layou on the Leeward coast. One evening, while travelling from Kingstown, the capital, to his home parish in Layou, the muffler on his old Hillman broke and was dragging on the road. It was pitch dark and he stopped. Quite a quandary he was in. Seemingly out of nowhere, a man appeared and inquired about Ambie’s problem. The man then removed his shirt, placed it on the car hood and crawled beneath the car to examine the damage. After his inspection, he walked over to an old fence nearby and removed a piece of wire, which he used to secure the muffler. He then proceeded to continue on his way in the dark. Ambie asked if he would like a drive, but the man declined. This was a small village where everyone was known. Yet, after providing a description, no one could identify this Good Samaritan. And Ambie, who knew everyone in these villages, never saw that man again. What happened do you think? What is your experience of the Good Samaritan? Fr. Ermes Ronchi’s Lenten meditation for Pope Francis and the Roman Curia on the fifth day of their spiritual exercises this year in Ariccia, in the hills outside Rome, was about embodying the compassion of the Good Samaritan. Fr. Ronchi said that there are three verbs that lead to compassion: see, stop, and touch. All three have application in the above two stories of the Good Samaritan and in our own experience of compassion. When one shows compassion, one is willingly entering the “chaos,” and the “misery” of another. To show compassion can be a risky and dangerous business. The reader needs to keep in mind (and this is in accord with many scripture scholars) that there are three Hebrew words—compassion, grace, and love—that can be rendered as MERCY. Many writers are saying that when one shows compassion, one is willingly entering the chaos and the misery of another. To show compassion can be a risky and dangerous business. It is hard to show compassion at a distance. Compassion is to enter another’s suffering. Compassion is to enter another’s need. 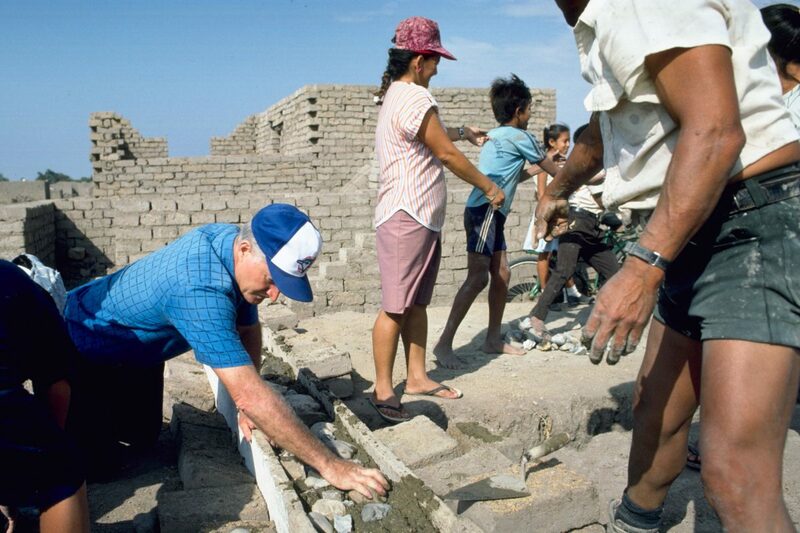 For the Samaritan in Luke’s Gospel, help came from an unlikely source. The Samaritan was despised by Israel. He was in unwelcome territory and risked his life to stop and assist the one who was beaten and robbed. Compassion needs to be extended beyond family, clan, friends, and race, even to our enemy. Everyone is my neighbour. Viruses are not the only things we catch. We can also catch compassion. It can be contagious. Think of the response of people around the world to the image of the refugee child’s body washed ashore and carried in a man’s arms. Recently in the news, there was the story of a man who visited his sick child in the pediatric ward of a hospital and fell asleep under the child’s crib. Keeping vigil repose, in a sense. We can catch good things also. The follower of Christ first asks the question: How can I alleviate this person’s suffering and misery? Then the follower of Christ needs to ask: Why did this situation come about? Why was the man robbed in the Good Samaritan story? Why was the refugee infant washed ashore?